Recently on 07th Nov 2018, Gujarat Forest Recruitment 2018 Notification out by ગુજરાત ફોરટે ડીપાટમેટ/ ગુજરાત વન વભાગ for 334 Forest Guard (Vanrakshak) Posts. Know the Gujarat Forest Bharti 2018-19 Vacancy, Eligibility Criteria, Salary/Pay Scale details, etc. The forest.gujarat.gov.in Recruitment 2018 Apply Online Link active from 14/11/2018. 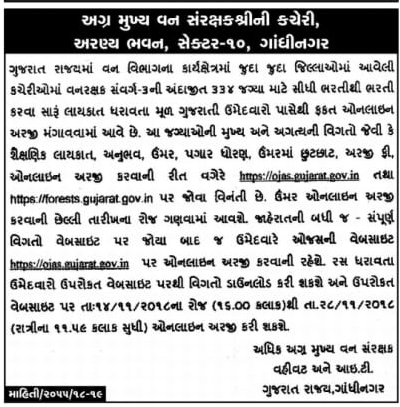 Eligibles can apply for Gujarat Forest Department Recruitment 2018 before 28/11/2018. Scroll down the page to get the clear details of Guj Forest Guard/Vanrakshak Recruitment Bharti 2018.